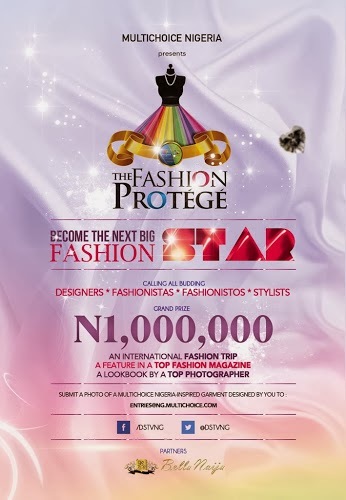 MultiChoice Nigeria is on a hunt for Nigeria’s Most Talented Fashion Protégé! Created to celebrate the 20th Anniversary of MultiChoice Nigeria, The Fashion Protégé is a 5-Episode Nigerian Reality Television Series that will air later this year on DStv’s AfricaMagic. Contestants guided by Mentors will compete to be recognized as Nigeria’s Next Big Fashion star! Designers, Fashionistas, Fashionistos, Stylists and Everyone who is fashion savvy, this is an opportunity you cannot miss! Get your creative and resilient spirits energized, as we will test your ability to succeed in the cutthroat Fashion Industry. If you know you’ve got all it takes to make it big in Fashion, then be ready to prove it! 3. Take a photo of your design and submit via email to entries@ng.multichoice.com. Photo must be accompanied by a short explanation of how design is inspired by MultiChoice Nigeria. • 1 winner will emerge! 2. Designer, Stylist, Fashion Enthusiast. Ability to sew not compulsory for participation. However, Creative Direction must be executed by contestant. 4. Contestants must be based in Nigeria. Up For grabs is N1,000,000, Mentorship by a renowned Nigerian designer, an International Fashion Trip, a Special Feature Interview on BellaNaija, a Feature in a Top Fashion Magazine & a Lookbook by a Top Photographer.